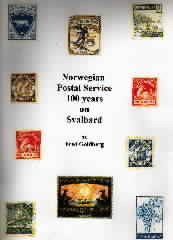 NORWEGIAN POSTAL SERVICE-100 YEARS ON SVALBARD by Fred Goldberg. Contains valuable supplemental information about polar flights from Spitsbergen. Many rarely seen photos of mail associated with historic polar flights. NOW AVAILABLE. Amundsen Expedition Mail. Price US$15.00 postpaid from the above address. This book is the catalogue for an exhibit of Amundsen Expedition Mail at the Fram Museum in Oslo, Norway.